Anytime Dept. presents State Dinner, a solo exhibition by the San Francisco-based artist Bean Gilsdorf. Expanding upon her decade-long practice of transforming images culled from mass-market history books, Gilsdorf presents a suite of works (all 2018) that investigate political "soft power" and the ways in which it is both produced and mediated by iconographic imagery. In the front gallery, sculptures representing the past nine first ladies of the United States occupy the walls and part of the floor. Like three-dimensional collages, the individual sculptures are composed from several images, and each FLOTUS is depicted in a garment that references her White House apparel. Meticulously sewn from polyester, silk, wool, and home-decorating fabrics, using the techniques of both couture and soft furnishing, the sculptures sag and slump against their supports, distorting faces and limbs. Every sculpture is created to be a hollow shell—part costume, part slipcover—implying that the construction and presentation of the public image is more important than the actual lives of these women. "First ladies are proximate to power, but their own is contingent and unstable,” Gilsdorf observes. “Their public force is exercised through fashion, state dinners, and civic campaigns, but privately we many never know the full extent of their wills. How much influence did or do they hold? For which national triumphs or horrors shall we hold them at least partly responsible?" In the gallery office, the spouses of the first ladies make their appearance in the form of nine commemorative ceramic plates lining the walls. Also produced using imagery extracted from conventional history books, the plates similarly depict each of the presidents in such a way that their iconic visages become warped and distorted. Gilsdorf describes the impulse behind these works as “anti-commemorative,” forced to look at things we'd rather not have to consider—in this case, the use of the image as an instrument of power, one that makes authority seem both inevitable and entirely natural.The exhibition runs from July 21 through August 26, 2018, with an opening reception for the artist on July 21 from 6 to 9pm. Bean Gilsdorf is an artist and writer based in San Francisco. Her sculptures and performances delve into the relationship between historical narratives, the iconography of political power, and the ways in which representations influence cultural values. Her projects have been exhibited at the Museum of Contemporary Art, Santa Barbara; the Wattis Institute for Contemporary Arts; and the American Textile History Museum; as well as exhibition spaces in Poland, England, Italy, China, and South Africa. Gilsdorf graduated from Simon’s Rock at Bard College with a BA in Literature, and received her MFA from California College of the Arts. She is the recipient of numerous grants and fellowships, including a Graduate Full Merit Scholarship at California College of the Arts, a Graduate Fellowship at Headlands Center for the Arts, the Bess Winspear Memorial Scholarship at Banff Centre, and 2015 and 2016 Fulbright Fellowships to Poland. Gilsdorf is the former editor in chief of Daily Serving, and her critical writing and interviews have been included in publications such as Artforum, BOMB, and Frieze. Bean Gilsdorf, MO (detail), 2018, Cotton, polyester, silk, wood, paint, approx. 62 x 38 x 29 in. 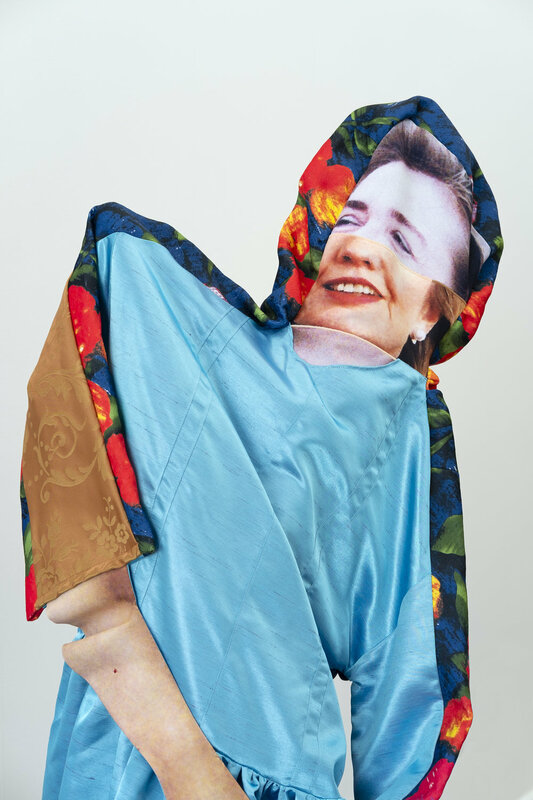 Bean Gilsdorf, PN, 2018, Polyester, cotton, spandex, 40 x 17 x 5.5 in. 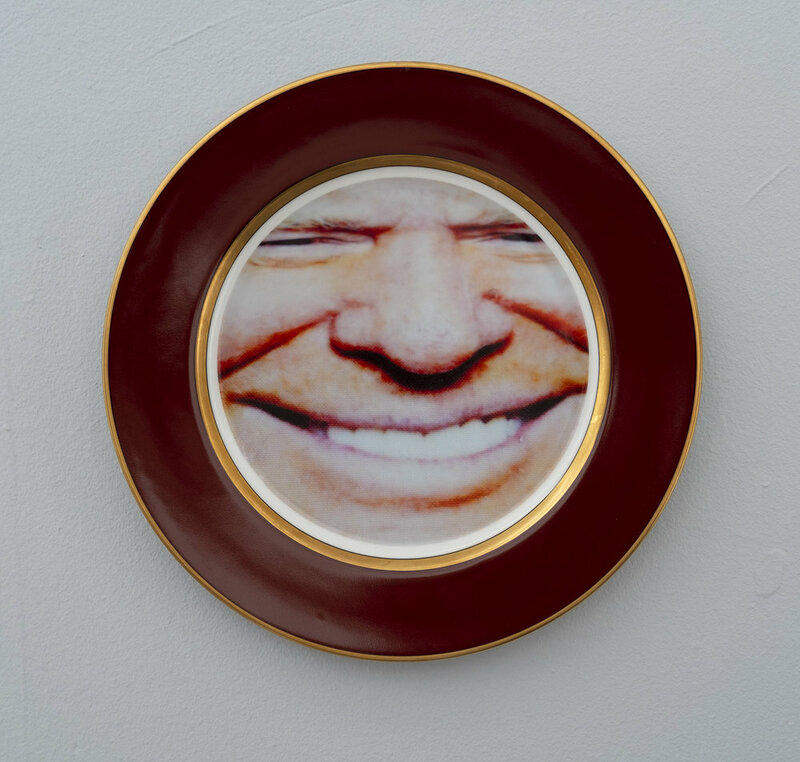 Bean Gilsdorf, Richard Nixon, 2018, Ceramic plate, 10.25 inch diameter.